Geology challenges the human imagination. First of all, there is the notion of geologic time. We humans think in terms of lifetimes or of centuries. What can 10,000 years possibly mean to us, let alone 65,000 or 70 million? Space, in geologic terms, is an equally difficult notion, though we don't often recognize the difficulty. We often wonder what the land we stand on was like in times past. What was here, we ask, when dinosaurs roamed, or when mountains were new? Though we may imagine different landforms, different vegetation, we probably still imagine "here" as a definite, and permanent, spot on the globe, a place with constant longitude and latitude, a place whose changes we could trace through time, perhaps by reading the record in the strata beneath our feet. But geology mocks our notion of permanence. Geology deals with continents that drift, collide and re-form, with rivers and oceans that appear and disappear, with mountain ranges whose battered remnants have been carried away and now lie buried on some other continent. Geology warns us not to be too literal as we imagine the history of our planet. Geology, the interpretation of earth and life history, encompasses much more than the study of sterile rock masses. Continents, oceans, the climate, our atmosphere, and all life have co-evolved on this planet in a complex, interwoven web. Inorganic environmental changes occur, and all life forms must adapt quickly, in terms of geologic time. There are many ways the earth may influence a local ecosystem. The least obvious is slow continental drifting across lines of latitude or longitude, which affects circulation patterns in the oceans, storm tracks, mean temperatures, and the timing and duration of seasons. Mountain chains appear near coastlines for various geologic reasons, setting up orographic (mountain-induced) cooling of rising moist air masses to form coastal fog deserts and rain shadow deserts on the protected sides, such as coastal Baja California and the hyper-dry Mohave Desert, respectively. Upland canyons, piedmonts, and mountaintops create new ecological niches, sites of adaptations and evolutionary change. The Sonoran Desert and nearby mountain islands exhibit nearly two miles of vertical relief, from sea-level deserts to mountaintops at 9500 feet (2900 m) that harbor sub alpine spruce-fir forests, cool enough to have supported semi-permanent ice masses on shady north slopes during the Pleistocene (the past two million years). Then as mountains slowly erode to flatlands, the climate pattern changes. As climates and habitats change, plant and animal species either adapt, migrate to more favorable ground, or become extinct. Migratory routes are often determined by geologic processes. For example, climate dictates that a river be perennial or intermittent, and that a lake expand or dry up. New mountains produce new rivers. These changes may block or expedite migration for a terrestrial animal while serving as barriers or corridors for an aquatic one. Ancient life affects later geologic and climatic conditions. Biologically-produced gases (oxygen, carbon dioxide, methane, nitrous oxide) maintain a chemically reactive atmosphere that in turn influences rates of rock weathering, the nature of sedimentary deposits, and the content of gases in the atmosphere. The Sonoran Desert lies in a region of the West called the Basin and Range geologic province. This curious country consists of broad, low-elevation valleys rimmed by long, thin, parallel mountain ranges, which extend from northern Mexico across much of Arizona, California, Utah, and Nevada, northward to the southern plains of Idaho. (See the map below.) Normally dry streams in each valley either connect to a major through-flowing river, such as the Gila or Salt rivers, or else drain into a valley's internal low spot where a salt-encrusted playa forms. California's Imperial Valley, and several other valleys within the American Southwest, exhibit this internal drainage. Topography is an important influence upon the unique climate of the Sonoran Desert, since topographic barriers direct, confine, or block moist air masses. We can see such a confinement for the Sonoran Desert on the map below, which resembles a shallow bathtub, breached at its south end where it receives Pacific moisture, and at its north end where it joins the rain-starved Mohave Desert. Let us consider the topography of the areas on the periphery of the Sonoran Desert, since these lands both help define and affect the desert itself. Considerable high country exists west of the Sonoran Desert in Baja California's Sierra San Pedro Martir and in southern California's coastal Laguna Mountains, loosely joined to the imposing Sierra Nevada farther north through the Palm Springs region. The backbone rock of this country is vast masses of Cretaceous-aged granites, 140 to 80 million years old . The Sonoran Desert is bounded to the northeast by a mile-high escarpment called the Mogollon Rim, which forms the distinctive southern edge of the Colorado Plateau province. The Colorado Plateau extends north across Utah and western Colorado and consists of a grand "pancake" pile of sedimentary rocks of diverse age (from 30 million to 1200 years old), exposed over a wide area, but most famously in the walls of Arizona's Grand Canyon National Park. The eastern edge of the Sonoran Desert in southeastern Arizona consists of a honeycomb series of high valleys and mountain ranges, including the Pinaleno and Chiricahua Mountains. Mountaintops range from 3000 feet (915 m) in the west to 10,000 feet (3050 m) in the east. The elevations of valley bottoms rise from sea level near Yuma to 5000 feet (1525 m) in southeast Arizona, where deserts are replaced by grassland valleys. Since rising air cools, annual precipitation and wintertime cold extremes intensify to the east, causing the desert, with its frost-sensitive plants, to gradually give way to grassland. The Sonoran Desert's southeastern edge is defined by Mexico's Sierra Madre Occidental, a tall, mountainous accumulation of 30-million-year-old volcanic rocks, which stand exposed in the cliffs of the pine-covered country of Barranca del Cobre (Copper Canyon) of Sonora-Chihuahua. How strange that many isolated springs of the Sonoran Desert contain several varieties of small cyprinid fish, the desert pupfish. These little, unlikely desert survivors can tolerate mildly saline and very warm waters. Their dispersal across much of Basin and Range country, even into totally isolated valleys, must have occurred during the Pleistocene when the Colorado River system flowed more vigorously, allowing them to explore all the back alleys of this aquatic kingdom. Then when drier times came, their habitats shrank back to only the perennial springs they inhabit today. At least one variety of pupfish has gone extinct with the introduction of game fish. This survival story, like so many others, continues to unfold as the Sonoran Desert evolves. The recent geologic history of the Sonoran Desert includes an event unique in all the world, one that tore the country apart. This "Basin and Range disturbance" was the culmination of several events that have taken place over the last 40 million years. Before this geologic onslaught there is good evidence the region stood as an extensive upland, devoid of today's mountains and smoothly connected to all the surrounding highlands (see map above). Starting with this flatter land, several interconnected geologic actions produced the modern Sonoran Desert landscape. A visitor to Basin and Range country 40 to 20 million years ago might have been alerted to one of the deep-seated geologic events by noting numerous active volcanic centers in the region. These volcanic areas occasionally produced tremendous explosions, and left behind extensive volcanic flows. Some of these volcanoes then collapsed, forming large circular basins called calderas, as seen in the Chiricahua and Superstition mountains. Other centers, such as the Ajo, Kofa, Galiuro, and Gila mountains, ejected ash-flow materials from long, thin fissure vents. Exciting as this surface activity was, far more impressive events were occurring below. Intense heat rising into the crust was hot enough to entirely melt and soften portions of the lower continental crust into a viscous fluid, similar in consistency to molasses taken out of a refrigerator. This heating became important when the Pacific Coast became somehow attached or glued to the edge of the Pacific Ocean tectonic plate, which was at the time beginning to move northwest relative to the main continent. This movement applied a stretching force to the region. Basin and Range crust, being hot and fluid, could not resist this force and so began to stretch apart in a giant geo-taffy pull. Think of what happens as you bite into a caramel candy coated with hard chocolate: the fluid caramel stretches while the brittle coating shatters. In this way Basin and Range crust began breaking up, resulting in tremendous disruptions. Early pull-apart action 25 to 20 million years ago was localized along the line of mountains (shown as metamorphic core complexes on the map, above), where tremendous heat from beneath was concentrated. (See illustration A.) This heated zone across Arizona responded to the pull-apart force by forming a huge fault zone, along which all the land west to the Pacific Coast was pulled away. Several nearly flat faults, such as the Catalina detachment fault shown in illustration B, accommodated this motion. Once uncovered by the faulting, the fluid granite rocks of these "metamorphic core complex" mountains rose or arched up further into an aligned series of "pimples," due to their heat and buoyancy. Rocks above the detachment faults moved a considerable distance to the west, perhaps ten miles or farther, from the arched terrain. These spectacular processes probably lasted for a few million years. Following this activity, the stretching action quickly spread across most of the entire region, which would eventually become the modern Basin and Range country. By about 12 million years ago, the entire substrata of Basin and Range country was involved with the expanded taffy-pull, stretching out some thirty to eighty percent more than its original width, while the brittle crust above shattered into hundreds of long, thin segments. Narrower alternating segments tended to sink into the taffy, while alternating wider slices maintained more of their old heights. (See illustration C.) Virtually all mountains of the region were simultaneously born in this way; this also explains the semi-parallel trend of the region's mountains and valleys'they are perpendicular to the direction of stretching. By about 8 million years ago, the pull-apart action stopped, the thinned crust cooled, and Basin and Range mountains and valleys stabilized. Since that time the chief geologic activity has been the movement of rock debris off mountains and into adjacent valleys through stream action, as seen in illustration D. Most Basin and Range valleys are filled with 5000 feet (1525 m) or more of gravel, sand, and clay beds, the geologic containers for our desert aquifers. Basin and Range country is unique'no other region of similar origin is identified on the planet. Plates 4, 6, 9, and 13 show the end result of Basin and Range formation and the long period of subsequent erosion. Near the end of major Basin and Range formation, about 6 million years ago, a severe sideways ripping action began along the Pacific coastline; this continues in our own time. The crack at the edge of the ripped-off land is called the San Andreas fault; it is responsible for the separation of the Baja California peninsula from mainland Mexico and for the opening of the Gulf of California. (Refer to the seismicity map.) The northward dragging action is related to that which originally ripped apart Basin and Range. These days the San Andreas fault allows for the transport of all land on its west side (the Baja California peninsula and parts of western California) toward the north in a very irregular fashion at the startling speed of a few inches per year. Plot of ten years (January 1, 1984 to December 31, 1994) of seismicity of all magnitude earthquakes from the Preliminary Determination Epicenters catalogue compiled by the National Earthquake Information Center. The San Andreas fault, the focus for many earthquakes shown on this map, runs up the Gulf of California and northward along California's coastal region. Plotted by Mark Tinker and Susan Beck at the University of Arizona. Except for the major influence of San Andreas fault activity, the Sonoran Desert is seismically quiet, with noticeable earthquakes felt less than once per few decades. However, slight readjustments to changing conditions do occur. Ground ruptures associated with prehistoric earthquakes are known from near the towns of Green Valley and Gila Bend in Arizona. The last major earthquake in the Tucson region was felt on May 3, 1887, at 2:15 pm. That afternoon the earth's surface ruptured with an estimated magnitude of 7.2 on the Richter scale at a place some twenty miles (38 km) south of Douglas, Arizona, near the village of Bavispe, Sonora . It was responsible for fifty-one deaths in Mexico, while cracking plaster walls in Tucson and El Paso, knocking over an adobe wall at the Spanish cemetery at Mission San Xavier del Bac near Tucson, and stopping large pendulum clocks in Phoenix. Tucson residents reported large clouds composed of dust and forest fire smoke rising above the crest of the Santa Catalina Mountains and first thought it to be an erupting volcano. Apparently the fires were ignited by falling boulders crashing together and causing sparks on the dry hillsides. Tohono O'odham residents at the village of Pan Tak below Kitt Peak reported a massive rock fall. Geysers of water shot up from the flood plain of the San Pedro River, while other streams and springs throughout the region either dried up or initiated flow. An estimated 50,000 cattle died that year in the San Pedro River valley as a direct result of wildfires or later starvation. A line of recent small earthquakes from that fault zone appears on the seismicity map above. There have been two contrasting styles of volcanism in the Sonoran Desert in recent geologic time. The intense volcanic episode mentioned above produced rhyolites (light-colored volcanic rocks, relatively rich in silica, aluminum, potassium and sodium), created as the western edge of the North American continent moved over the Pacific ocean floor. The main mass of the Tucson Mountains is composed of rhyolite produced during an earlier rhyolite volcanic episode some 70 million years ago. (See illustration above.) In contrast, younger volcanic rocks formed during Basin and Range time (the last 10 million years) are called basalt (dark-colored volcanic rock, rich in iron, magnesium and calcium); basalt formed beneath the continent during pull-apart actions and rose along deep cracks. Rhyolite volcanoes tend to explode violently, like Mount St. Helens or Krakatoa. Basaltic eruptions are non-explosive; they produce lavas with a consistency of fifty-weight motor oil, which spread quickly across valley floors. There are three basalt volcanic fields in the Sonoran Desert, all formed within the past four million years. One of these, the Pinacate field, lies just north of Rocky Point, Sonora, and has rightfully become an international showcase of natural history. The field contains a central 4000-foot tall (1220 m) stratified volcano composed of multiple lava flows and ash layers, surrounded by approximately 400 outlying single-eruption basalt cinder cones and flows , and ten unusual steam-blast explosion craters, called diatremes, some with diameters in excess of a mile . These unusual craters owe their explosive origin to an encounter of the rising magma with water-saturated sediments, which adds the force of steam blasts to the normal volcanic fountain. Life's drama is abundantly preserved in the rock record of the region. Arizona's oldest rocks'1800 to 1400 million years of age'have not been adequately searched for remains of microscopic life. The oldest stratified rocks of the Sonoran Desert date from about 1200 million years ago, and contain horizons where mats and small mushroom-shaped colonies of algae once grew in protected aquatic habitats. The main threats to the survival of these organisms were the enormous Precambrian ocean tides. Paleozoic shales and limestones (570 to 240 mya) contain occasional remains of trilobites, shark and fish teeth, crinoids and corals, bryozoans, conodonts, clams, brachiopods, oysters and a variety of cephlapods (a class of mollusks, which includes the octopus and squid). We envision these creatures' homes as shallow tropical ocean waters with coral reefs, lagoons and inlets, reminiscent of the Bahamas-Florida-Mississippi Delta region. Mesozoic fossil beds (150 to 90 mya) represent a regional trend toward terrestrial conditions as the land rose and drained. River floodplain deposits of Jurassic or Cretaceous age in the Tucson Mountains contain tracks of lizards found with rare fossils of horsetails (Equisitum spp.) and petrified wood. Cretaceous beds contain clams, sharks, marine reptiles like the mosasaur (an aquatic monitor lizard), and turtles. Cretaceous low-elevation coniferous forests were resplendent with cycad and ginkgo trees, through which glided flying reptiles. Late Cretaceous strata of the northern Santa Rita Mountains contain a remarkable fossil record including the titanic long-necked sauropods, horned and duckbill dinosaurs, and some of Arizona's oldest fossil mammals. All these lived along large river floodplains and shores of ancient inland lakes, sharing territories with crocodiles and lizards. Cenozoic deposits contain a mammal-dominated fauna that inhabited a land reminiscent of a lush East African savanna. Earlier forms included ancestral horses, giant rhino-like titanotheres, and oreodonts (ancestors to peccaries and camels). By late Miocene and Pliocene time (10 to 2 mya) grasses and grazers became widespread. Pleistocene fauna of the last 2 million years included camels, herds of bison and near-modern horses, mastodons, imperial mammoths, giant ground sloths, wolves, lions, giant beavers, and short-faced bears. North America's first people left dart points imbedded in fossil remains of some of these animals at sites near former springs. The modern Sonoran Desert ecosystem seems a distant cousin to the ancient environments of the region. The Pleistocene Period, the last two million years, is noted for its glaciations and worldwide flip-flopping climate changes. These climate shifts have left marks upon the Sonoran Desert. Though glaciers in Arizona mountains were confined to elevations above 9000 feet (2740 m), vigorous stream runoff during the first million years removed much soil and debris from mountain slopes and deposited it in many large fan-like deposits below the mouths of the larger canyons. (See photo below.) Then the streams in the larger valleys of the region began to down cut their channels to lower levels, which then side cut, causing the formation of several sets of flat-topped terraces above modern flood plains . The last permanent high-elevation ice masses were rapidly melting 14,000 years ago, and the regional climate was becoming drier and modern (interglacial) by 12,000 years ago. This last climate change marks the birth of the modern Sonoran Desert ecosystem. The Sonoran Desert contains a characteristic series of landforms, shown in the illustration below. Sparse regional rainfalls tend to lack the force to move sediments very far from the mountains. However, rare heavy rains produce torrents of mud, rocks, and vegetation that cascade rapidly down steep narrow canyons in the mountains. This debris flow spreads out at the fronts of the mountains into cone-shaped masses called alluvial fans. (See photograph below.) When neighboring alluvial fans coalesce along a mountain front, the resulting landform is a bajada (bah-HAH-dah). 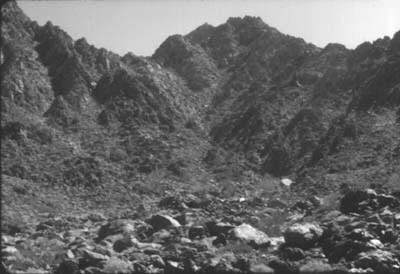 The term bajada is generally reserved for those areas where obvious alluvial fans line the mountain front, while piedmont is used in situations where alluvial fan shapes are not obvious. Beneath the bajada lies an important hidden feature of desert geology: the pediment. Pediments are buried shoulders of mountain rocks that extend from the edge of the exposed mountain some miles toward the valley center, where they contact the buried Basin and Range fault, beyond which lies thick valley alluvium (gravel, sand, silt, and clay). Pediments form as the mountain front is worn back with time by all the streams exiting the mountain front; then the shoulder is buried by a thin layer of gravel as the valley fills with alluvium. Their presence, though invisible, is very important for human development, since the main valley aquifer -often a mile thick- is confined to the centers of the valleys (see illustration). Water wells drilled into the pediment often do not yield sufficient water for even a single residence. Isolated small hills near mountains, called inselbergs, are exposed rock masses that have not worn away; they are a sure sign of the pediment's presence. Major valleys contain one or more main stream channels that are normally dry. Floodplains are strips of flat land adjacent to the channel that in former times were subject to flooding. But since the 1890s, river floods have tended to incise and widen the channels, so that the floodwaters do not flow out onto the floodplains, except locally. This post-1890s channel enlargement is part of a regional trend throughout the West called "arroyo cutting," likely caused by a combination of factors, including increased cattle grazing following development of regional railroads in 1882, de vegetation of hillsides by the mining industry for mine timbers and coke, and a possible unrecognized, subtle climate shift. Local governments take a risk in stabilizing channel embankments with soil cementation. Haphazard bank stabilization increases channel erosion (bank caving) and floodplain inundation downstream of the protected reaches. This is because cement-lined channel walls prevent infiltration and force more water down the channel. Alluvial fan. Boulder debris in front of the Gila (Sheep) Mountains near Yuma. Large rocks like these are transported in massive debris flows down steep canyons, then spread out along the mountain front during times of rare, intense rains. In the mountains, balanced boulders form from certain rock types, such as granite and thickly-layered sandstone or volcanic ash. The rocks weather down along cracks or joints and tend to form spires or irregular columns. Rounding happens as corners weather faster than sides, just as the cube of ice in your iced tea melts into a sphere. If a flat (horizontal) set of joints is also present, weathering along this base eventually forms a rounded balanced boulder. Boulders are eventually shaken free by earthquakes or uneven weathering and litter the nearby ground. These same kinds of rocks, when more fracture-free, may weather into large, spectacular domes that develop concentric rounded joints just like a layered onion, from which segments of layers separate, exposing a cone-shaped core. Balanced boulders can be seen along the Gates Pass road in the Tucson Mountains, along the Mt. Lemmon highway at Geology Vista, in Texas Canyon along I-10 east of Benson, and on Camelback Mountain (Echo Canyon) in Phoenix. Spectacular conical granite domes with "onion-peel" structures may be seen along the high ridges on the west side of the Santa Catalina Mountains above Catalina State Park. Mountains composed of volcanic layers weather into rugged tablelands cut by sharp canyons, such as in the Ajo, Tumacacori, and Kofa Mountains. The sharp eye may spot a vertical cylinder of resistant rock weathering away from a volcanic cliff; often this is a volcanic neck or plug, which was formed in the feeder vent for a volcanic flow. There are good examples of volcanic necks in the Superstition, Tucson, and Ajo mountains. Sand dune fields are common in the Sonoran Desert. Dune fields occupy downwind portions of valleys where wind-dispersed sand has accumulated. Sands for the Gran Desierto of northwestern Sonora, the Algodones dune field east of El Centro, and the Mohawk Valley field east of Yuma all derive large quantities of sand from the Colorado River delta. The vast Cactus Plain dune field near Parker derives its sand from the old shoreline sands of the Colorado River. Many other minor dune fields are found throughout the region, their sands derived from local river flood plains. The Gran Desierto contains examples of star dunes, with several radiating sharply-crested sand ridges coming off a high point. Maybe the only way to fully comprehend the geologic processes that have shaped the Sonoran Desert is to immerse oneself in the study of the region's natural history. Still, hints of profound relations are everywhere around us: storm tracks funneled by Basin and Range topography, which ultimately define the region's ecological limits; the very different past worlds represented in the fossil record; hard granite rocks torn apart by small lichen colonies; the wide variety of landforms and rock types. Also, we must remind ourselves that the true character of the land is much more than what's on the surface-the often-neglected third dimension is vital, as miners, soil engineers, and water well drillers know. All these effects of the past are interwoven into a tapestry of cause and effect on a grand and wondrous scale. Chronic, Halka. Roadside Geology of Arizona. Missoula, Montana: Mountain Press Publishing Company, 1983. Harris, Stephen L. Agents of Chaos. Missoula, Montana: Mountain Press Publishing Company, 1990. Nations, Dale and Edmund Stump. Geology of Arizona. Dubuque, Iowa: Kendall/Hunt Publishing Company, 1983. McPhee, John. Basin and Range. New York: Noonday Press, 1990. Sharp, Robert P. Geology Field Guide to Southern California. Dubuque, Iowa: Kendall/Hunt Publishing Company, revised edition 1976. Sheldon, John. Geology Illustrated. San Francisco: W.H. Freeman & Company, 1966. Sykes, Godfrey. The Colorado Delta. American Geographical Society Special Publication No. 19, edited by W.L.G. Joerg. Port Washington, N.Y.: Kennikat Press, original pub. 1937, reissued 1970.